You know when you’re sitting around with a group of people and out of nowhere someone starts asking random questions? Well, that happened to me the other day, and the best question asked was, “What would you want your last meal on Earth to be?” Honestly, it didn’t even take me second seconds to blurt out, “Warm, gooey chocolate chip cookies and a tall glass of milk!” Now that’s what I call a sweet tooth! For as long as I can remember, I have loved chocolate chip cookies – Chips Ahoy, Tollhouse, Keebler, Soft Batch – you name it, I ate it! However, the one thing I wasn’t so good at growing up was making my own cookies from scratch. Sure, I could slice n’ bake and call them my own, but that’s not my style! I wanted to perfect my own chocolate chip cookie. The perfect opportunity came to be in the 10th grade. We had to bake cookies for Chemistry class (for pi day or something). I remember driving to the store to buy all the necessary ingredients, going home and actually making the cookies, and then being completely disappointed when they came out as hard as hockey pucks. I still brought them to class, only to have some boy throw one across the room to prove that they were unbreakable. Eek! Talk about embarrassed! So they don’t photograph well…you can’t have it all, people! I saw Katie’s Flourless Chocolate Chip Cookie recipe yesterday and just knew that I had to make something very similar very soon. So, I got home, ate a quick dinner, and got started. I was in an adventurous mood today, so I took her recipe and modified it a little. And if you’ve already read Katie’s post from yesterday, you know my cookies don’t look half as beautiful as hers, but they tasted really good. That’s what counts, right?! Preheat oven to 375 degrees. Combine first five ingredients in a blender until the mixture is coarsely combined. Melt the peanut butter in the microwave for 10-15 seconds. Mix melted peanut butter and apple sauce in with the dry ingredients. Add in the chocolate chips right before the mixture starts to form into a ball of “dough.” Form 6 cookie patties and place on lightly sprayed baking sheet. Bake for 9 minutes. Enjoy! 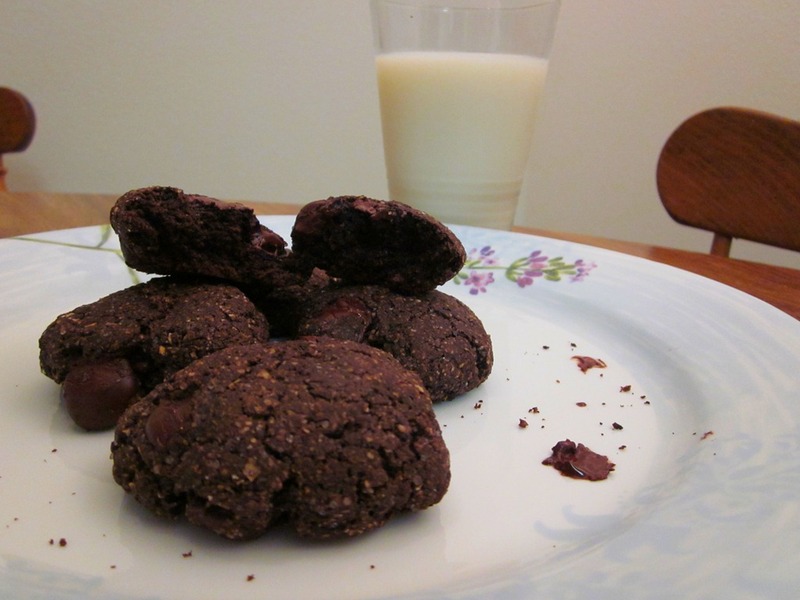 Sure, these aren’t decadent, rich cookies, but they sure did satisfy my sweet tooth. And if I can do that while still being healthy, I’ll take it! Off to watch some Wednesday night reruns. Does anyone know when new episodes of Modern Family start back up?! I would want my last meal on earth to be sushi followed by pumpkin pie. Random, but delicious! Um YUM. These look awesome. I would love sushi as my last meal on earth. And then a bunch of Magic Middle cookies…do you remember those? They were divine! Too bad they stopped making them. Ohh cheesecake is a close second for me!